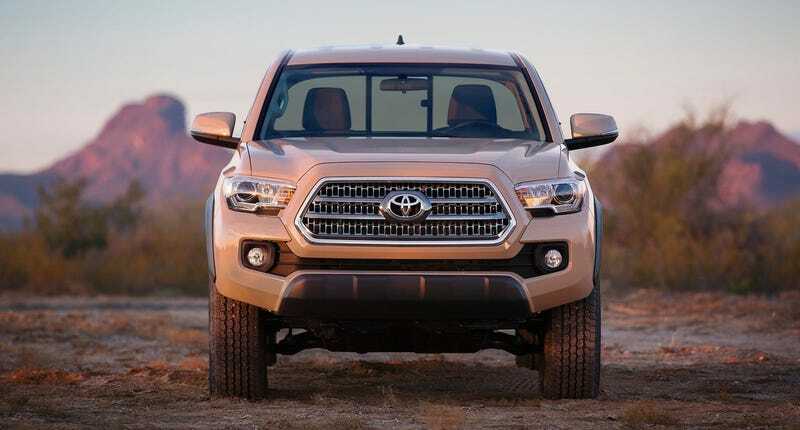 Documents that appear to have come from a dealer’s meeting lay out a pretty complete price and configuration list for the 2016 Toyota Tacoma. Check it out right here. An observant reader tells us these popped up on the Tacoma World forums but were quickly removed. Luckily for us, he was quicker to screencap and we’ve embedded the document below for you to have a look. Looks like 4WD trucks will still get a manual transmission option and as we’d already heard; Toyota is keeping four and six-cylinder engines for the truck. The TRD version, which was sort of the de-facto coolest version, is not the most expensive. That honor goes to the Limited at just over $39,000 without options. In fact, we’re not seeing a “TRD Pro” on the list at all... just a “TRD Sport” and “TRD Off-Road” which we’re thinking is a little different. Another interesting line was that bit about a $650 OEM tonneau cover (you know, one of those flat things that goes over the bed) had to be sold on 30% of Tacomas to meet CAFE requirements. I’m told this means the EPA lets Toyota advertise certain MPG figures achieved with the cover, as long as less than a third of Toyota’s truck are sold with said accessory. We’ll be looking into this a little more closely and circling back. Meanwhile, take a look through the paper, keeping in mind the prices posted “are subject to change.” Looks legit in general though. Image via Toyota, Hat tip to Ryan!